Buddy De Franco CDs @ Hep Records, jazz in depth from the 1930's to the present day. "1949-52 The studio performances by orchestra and quintet"
Arrangers George Russell, Manny Albam and Tiny Kahn. Soloists Al Cohn, Jimmy Raney, Kenny Drew and Teddy Charles. Titles - Boy Next Door / Bird in Igor's yard / This Time the Dream's On Me / Bud's Invention / Penthouse Serenade / Extrovert / Good For Nothin' Joe / Aishie / Out Of Nowhere / Dancing On The Ceiling / Rumpus Room / Body and Soul / King Phillip Stomp / Make Believe / St Louis Blues / Why Do I Love You / The Closer You Are / Too Many Dreams / Swing Low, Sweet Clarinet / Will You Still Be Mine / Lady Be Good / Buddy's Blues / Gone With The Wind / Sweet Georgia Brown / Get Happy / Cairo. 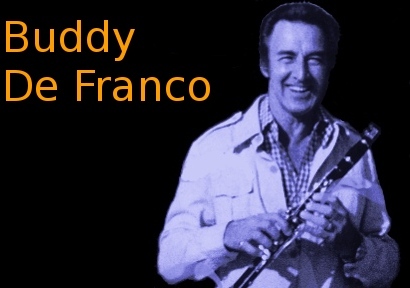 Buddy De Franco - "Dancing on the Ceiling"
Live concert performances from 1980. Titles - Billie's Bounce / Triste / Ja Da / Yesterdays / Mood Indigo / Scrapple from the Apple / Street of Dreams / The Song is You. Buddy De Franco - "Billie's Bounce"
"Buddy De Franco meets Martin Taylor"
with Alex Shaw, Ronnie Rae and Clark Tracey. Titles - Whispering / I got a right to Sing the Blues / Manhattan Tea party / Goodbye / Just Friends / Angels Camp / Dark Island / Prelude to a Kiss / I got Rhythm. Buddy De Franco / Martin Taylor - "Whispering"